There are many reasons for why people experience neck pain. Certainly, acute trauma from whiplash or other injury can cause sprains and strains in the neck muscles or other types of damage to the spine. 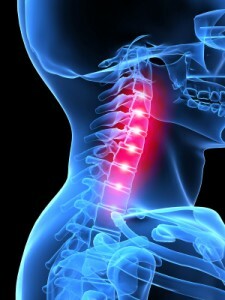 Most people with neck pain, however, do not know how or why they have neck pain. Some people can wake up with a “kink” in their neck and have difficulty turning their heads. Some people have a general feeling of stiffness and discomfort, especially after long hours of sitting. There are several reasons for why these things occur, and there is a complex relationship of discs, joints, muscles, and spinal kinematics that can trigger neck dysfunction and pain. The doctors at Boise Spine Center help to find the problem or source of the neck pain, and seek the proper solution to get out of pain, restore proper function, and prevent the problem from coming back. Often times, neck pain is the result of a postural or muscle imbalance syndrome called upper crossed syndrome. In this common scenario, some muscles become overly tight and some overly weak; the result is poor posture where the head drifts forward and places extra stress on the muscles in the back part of the neck and below the occiput, often causing other symptoms such as shoulder pain or headaches. Treatment, therefore, often requires exercises, stretches, and myofascial release, in addition to the traditional chiropractic adjustment.